After reading Alison's review of Nebo, I knew I had to check it out. Gluten free food in the North End? Yes please. I had been forced to visit Mike's Pastry one too many times in college with gluten eating friends. While I was left despondent waiting outside of Mike's my friends were inside gorging themselves on the famous cannolis. My friends and I set our sights on Nebo and made it there just in time to make our reservation. Once we arrived, we realized there was no need to worry about losing our spot -- the restaurant was nowhere near capacity. In fact, we were some of the only diners in the restaurant. While this normally makes me a bit nervous, the location was a bit off the beaten path (read: not on or directly off of Hanover Street) so we figured it would be fine. And, of course, Alison had already tested the water for us. We quickly ordered a bottle of wine and set our sights on the menu. A member of our party, Andrea, was a bit late because she was coming from work so we had plenty of time to look over the menu. When Andrea did arrive she came with a true Bostonian in tow -- I guess he helped her find the restaurant. Random. Back to the food. I was a bit discouraged to see the surchage placed on gluten free pizza. While I suppose that's a way of life for us gluten free folk, a $4 surcharge is pretty high, particularly if you are at a table that is entirely gluten free. You can check out the gluten free menu here. 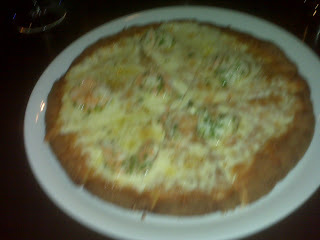 I finally decided on the scampi pizza gluten free while my friends opted for gluten filled pizzas. We ordered a bottle of wine, had a few drinks and caught up while waiting for our pizzas. The pizzas were served up warm and were delicious! I apologize for the below photo -- I definitely need to get in the habit of bringing my camera along with me and not relying on my cell phone's inadequate camera. I really enjoyed the pizza at Nebo and think Alison described it perfectly -- there was a sweetness to it that was unexpected. Nebo definitely serves up one of the better gluten free crusts around. In fact, I preferred Nebo's crust to Stone Hearth's because it is fuller and more closely approximates the pizza crust I remember from my gluten eating days. So all in all, the pizza at Nebo gets a huge thumbs up. However that same thumb is enormously down for Nebo's service. In two words: excruciatingly awful. Truly horrendous. Unbelievably bad. OK, that was three sentences, but each consisted of two words so it's fine, right? As I said earlier there were about 10 people (total) in the restaurant the night we went -- and that 10 includes my party of 4! Nebo is a large restaurant and looked like it could handle a lot more customers, but the night we visited it could barely handle those 10 customers. Note that those 10 customers weren't even all at once; we were there from 8pm until 10:30pm and there were only two other tables with customers in the time we were there. Our waiter was inattentive for most of the meal, pushy when he was attending to us, and altogether frustrating. He continuously made recommendations without having been solicited for them in a way that interrupted the table's conversation. More importantly, however, is that he consistently recommended the more expensive option in every recommendation he made. It seemed like he was trying to pump up his earnings because of the lack of customers -- and we had already ordered drinks, wine, and dinner! That's not the only reason we believed he was trying to pump up his tips. When we gave him the bill to split, he split the bill and had already included a large tip for himself. I understand the policy of adding gratuity to parties of 6 or more, but we were a party of 4! When we explained the bill situation to him he seemed to immediately recognize the mistake that he had made -- perhaps too immediately, as my friend Caro thought. While I wasn't as suspicious as she was, I was certainly frustrated by the end of my Nebo dining experience. Overall, I'm not sure I would go back to Nebo. I truly enjoyed the pizza, but with the gluten free surcharge and the horrendous service we received, I'm not sure it would be a must visit for me. If I find myself in Boston's North End seeking gluten free food, I would be happy to come back to Nebo... but I won't be searching it out the next time I'm in Boston. Alison concurred in part, advising people to be clear about eating gluten free; she feared that the waiter might not remember if she hadn't reminded him!